Now that I have your attention, no there wasn’t an ACTUAL earthquake here in Chile, although the drink we tried is named for Chile’s notorious past with these natural disasters. 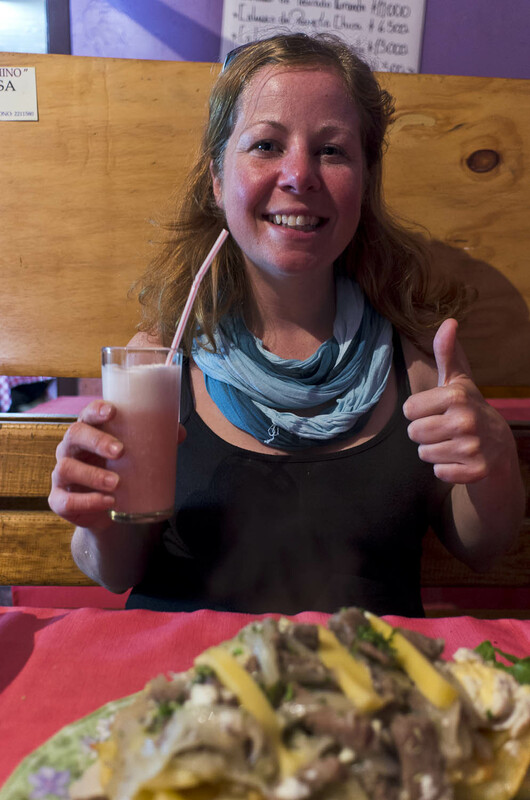 The earthquake we experienced was the ‘Terremoto drink’. It’s definitely not fancy enough to be called a cocktail! So what exactly is a Terremoto? It’s a party in a glass! 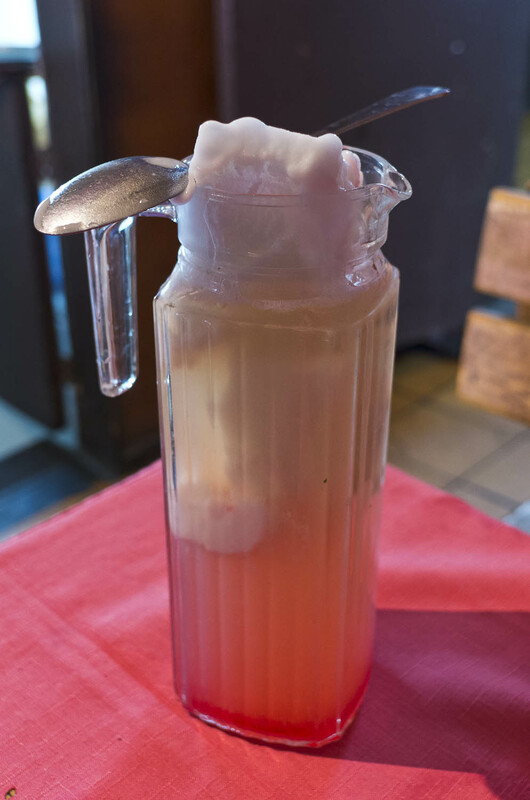 First, you take a mound of pineapple ice cream, then add what is known as pepiño, which is a sweet fermented wine. Mix it well with a big spoon and prepare for the trembling! Sometimes Fernet is added in, sometimes not. In the end, you are left with a drink that tastes a bit like an alcohol flavored pineapple candy! But it’s surprisingly refreshing (and holy smokes strong!). Your knees will feel a bit shaky and your head slightly tilted when you’re finished. And then you understand why it’s called terremoto! Valparaiso is the birthplace of the famous Chorrillana and what better way to complement your syrupy libation than a plate full of grease? Corrillana is close-to-perfection bar (or drunk) food. 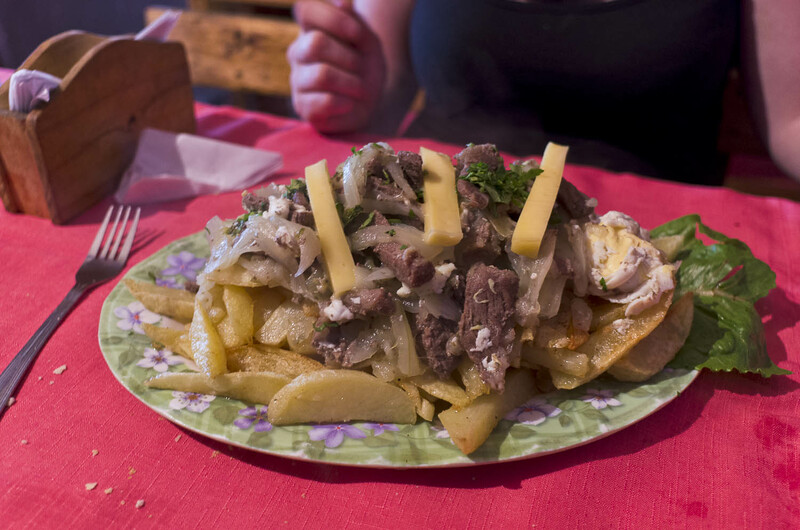 It’s a huge mound of papas fritas (french fries or crisps for you Brits) slathered with fried onions, meat, eggs and cheese. The meat varies, ranging from hot dogs (!) to steak. El Domino is a typical hole-in-the-wall type of place where you see many locals eating the menu del dia or the chorillana. There is nothing fancy about the place. Paper tablecloths cover uneven tables. The service is a bit on the surly side and you probably want to sit away from the bathrooms. When they first brought over the terremoto and the chorillana, I was sure I was not going to finish either the sickly-sweet looking concoction nor the heart attack on a plate. But after a glass or two of the terremoto, Laurent & I had no problem polishing off the entire plate. ← Would you like some crazy with your may?